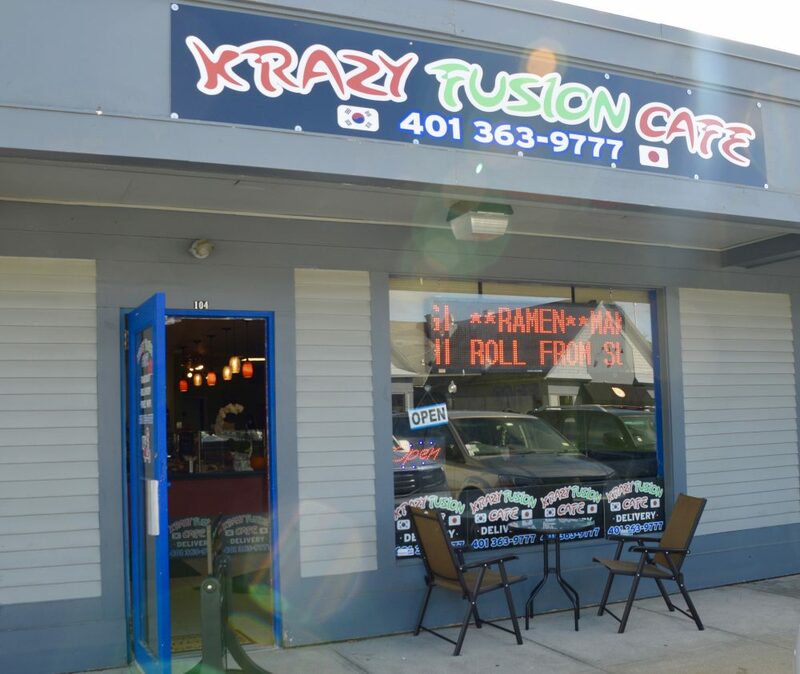 The Kingston Emporium, just on the edge of the University of Rhode Island’s campus, has a new offering in its lineup of quick service and casual dining: the Krazy Fusion Cafe. On first glance, the small location immediately gives the impression of a down-to-earth, family-run small business. The large sign on the storefront is an endearingly odd combination of complementary red and green text, and the indoor decorations look, if not homemade, then at least similar to something you’d find in the average home. The walls on either side of the dining and service counter keep the same red and green contrast, and the intentionally mismatched letters that hang from them spell out the restaurant’s name. The dining area and counter appear minimal and clean, with a few pumpkins for seasonal decoration alongside a row of new-looking tables and chairs. The kitchen is clearly visible from the main dining area, just behind the counter, and it was visibly well-kept, with staff continually organizing and cleaning the space in between taking orders. When I walked in the door for the first time, the woman behind the counter quickly welcomed me and explained how the menu worked, “like Chipotle-style,” as she said. The menu has two parts, one a quick service make-your-own-bowl from a selection of rice, meats, vegetables and other toppings, and the second a selection of Korean-style side dishes like Kimchi, Katsu, and Soba, among other things. The prices, especially for the main ‘bowl’ entrees, were very reasonable, with a simple chicken bowl with rice, veggies, and sauce available for under $7, and slightly more expensive options like shrimp, steak, and Korean Barbecue from $8 to $10 per meal, all available as either a bowl or a wrap. I ordered a “Krazy Fusion Bowl” with sticky white rice, spicy chicken, lettuce, bean sprouts, black beans, and boiled egg, with a side of soy sauce. Surprisingly enough, there was a one dollar upcharge for the boiled egg, which I happily accepted. The cost of my meal was still well under $10 for a quick dinner, comparable to any other quick service fare. The food was served in a to-go ready cardboard bowl, with meat on one side, and veggies and toppings on the other. It didn’t look too exciting, but the quality of the food and the ingredients well surpassed my expectations. The sticky rice had the perfect consistency and texture, a far cry from what passes for “sushi rice” or “sticky rice” at some chain restaurants. The chicken was also more spicy than I expected, with a surprisingly complex flavor that worked well combined with the other toppings. The portion size was definitely on the small side, though, especially when it came to the chicken. This was a bit disappointing because it left me wanting nothing else but to eat more of it. That’s not necessarily a negative, especially if you place an emphasis on health, but no matter how excellent the food is, and it was, leaving hungry will never be fully satisfying. In total, Krazy Fusion Cafe does a good job of staying true to the ‘Fusion’ in its name, faithfully executing a modern quick-service style of food with its Korean influence always readily apparent in the background. There is definitely room in the market at the Emporium for what Krazy Fusion Cafe offers, and if they continue to make high quality food, then it should only be a matter of time until URI’s students catch on.